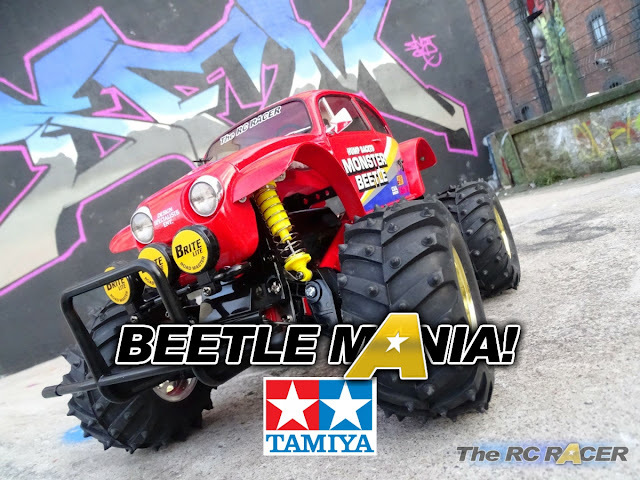 It is nearly 30 years ago that the original Tamiya Monster Beetle was launched. It was an instant smash and one of the most iconic cars of that era. 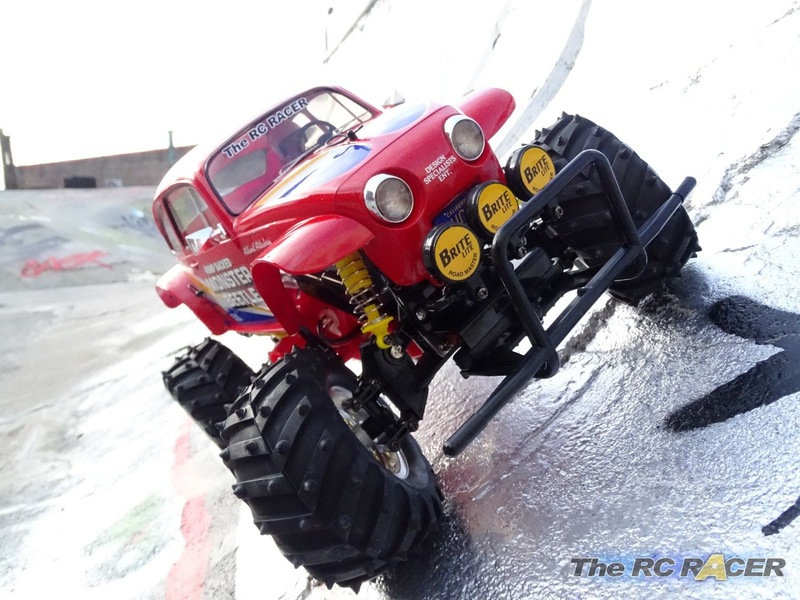 Now thanks to this re-release a new generation of drivers can pick up this greatly admired Volkswagen Monster Truck and experience what made it such a classic. Indeed I was really excited when this car arrived to review. I always wanted one of these as a kid but I have never owned one. 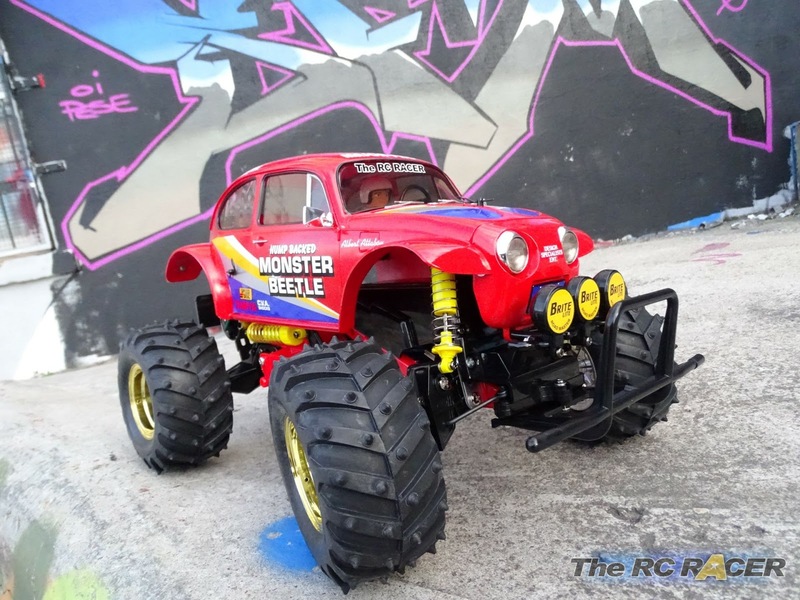 The Monster Beetle is based on the O.R.V. (Off Road Vehicle) chassis. 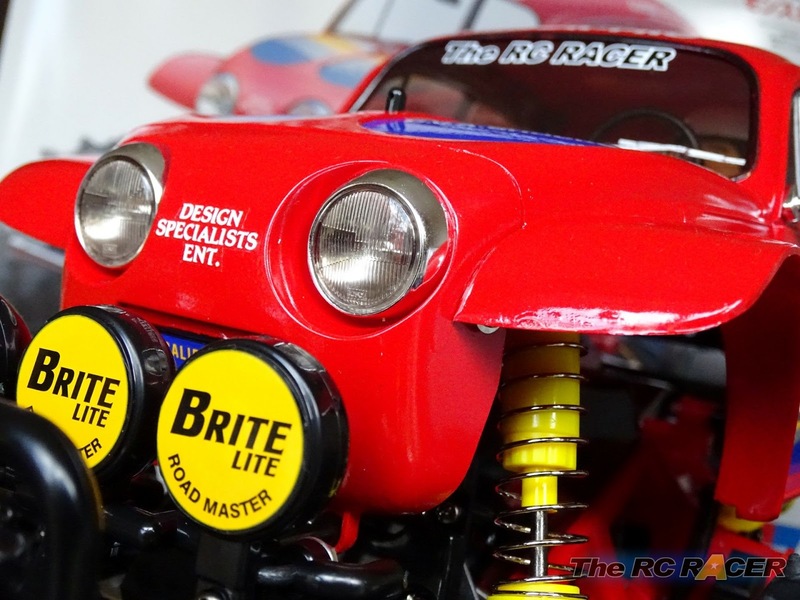 This was first used on the Tamiya Frog buggy. 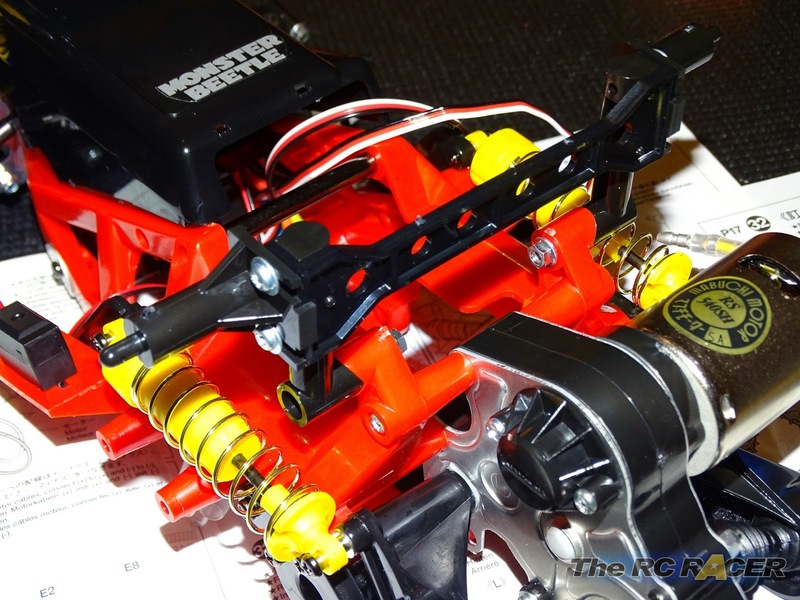 However it was changed (primarily the front suspension) for the Blackfoot and Monster Beetle. 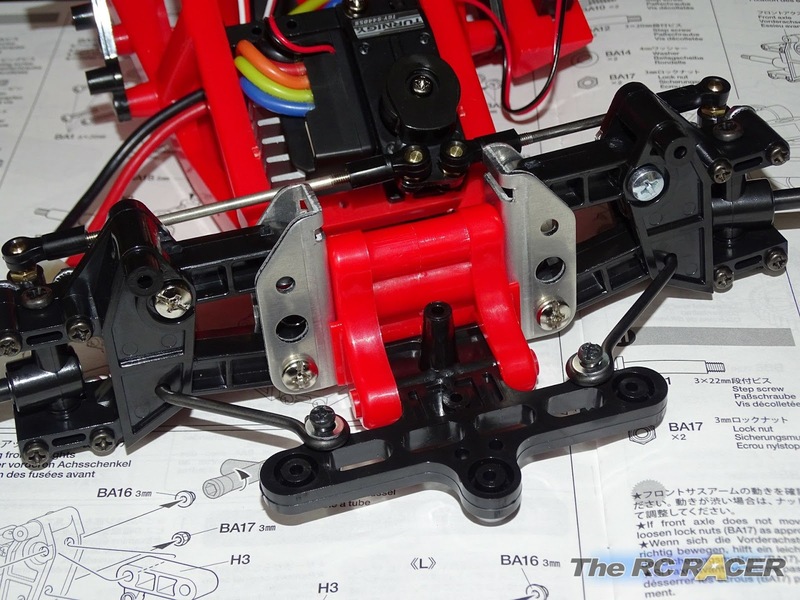 It has a distinctive red ABS frame, and this is what we start on for our build. I started off by fitting the chassis spacers. There are a collection of steel bars and plastic spacers to ensure that once the other part is attached it all stays together well. Next up you attach the battery hatch and the front chassis plate. The steel suspension stays are next. These attach to the frame and through the threaded steel bars. 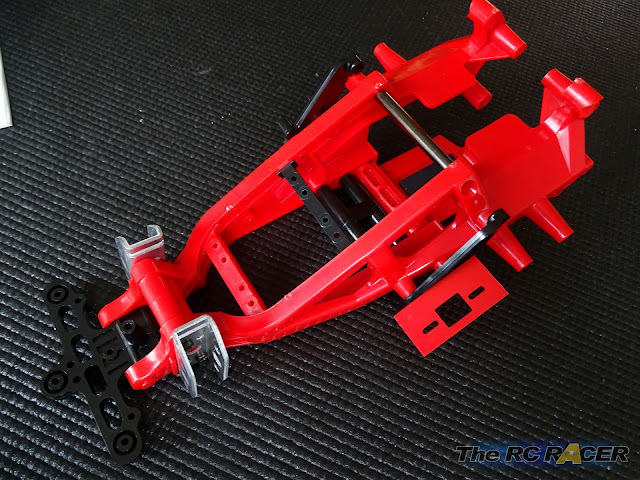 This design ensures that the front mounts will be able to take quite a lot of load before breaking, a good idea for something that screams out to be taken out and bashed. 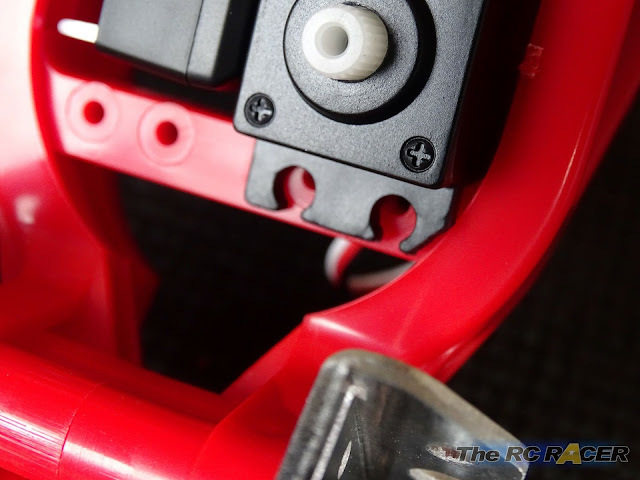 The rear suspension stays are then mounted alongside the switch holders, these are made of plastic and do have some flex. 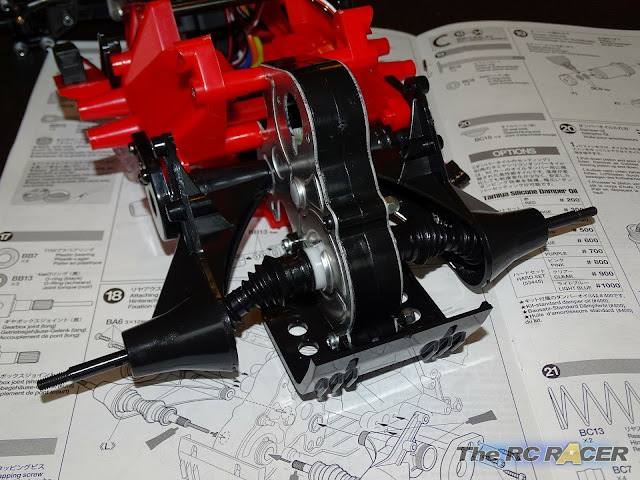 Next up it's time to fit the steering servo and esc. The kit included esc is the excellent TBLE-02s. 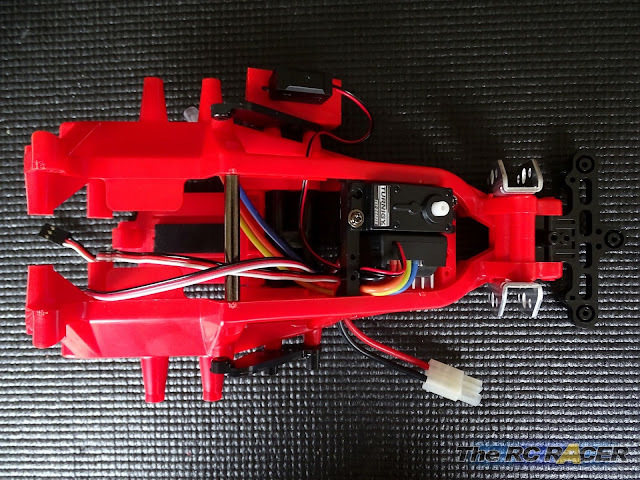 It is able to run the included brushed motor, and importantly it can also run a sensored brushless motor if you want to add more speed. 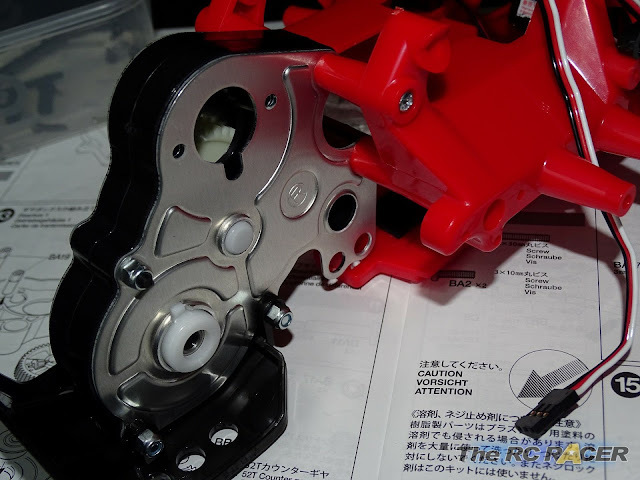 The steering servo is mounted to the chassis and the speed controller is attached with the included double sided tape. 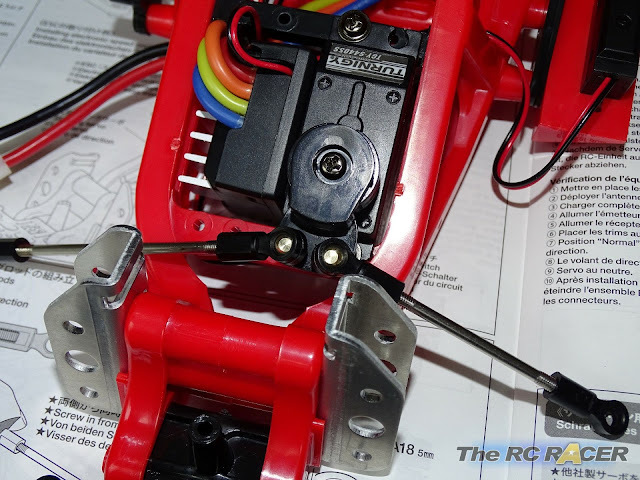 When fitting the servo you want it to be straight. I found that my servo lug was catching the bottom part of the frame. I just trimmed it a little and then it slotted in perfectly. 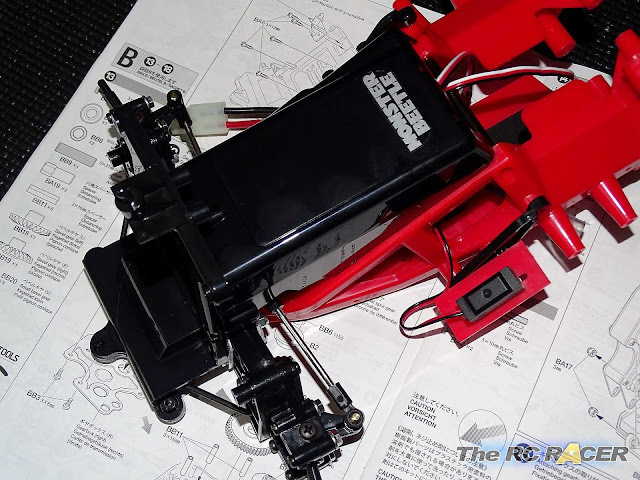 The next task was to squeeze all of the wires into the chassis and make it look neat. I took my time here as I am a little OCD about wiring. There is quite a lot of space, but it was a little tight around the speed controller. It is worth doing this though as it will be a pain later on in the build process. 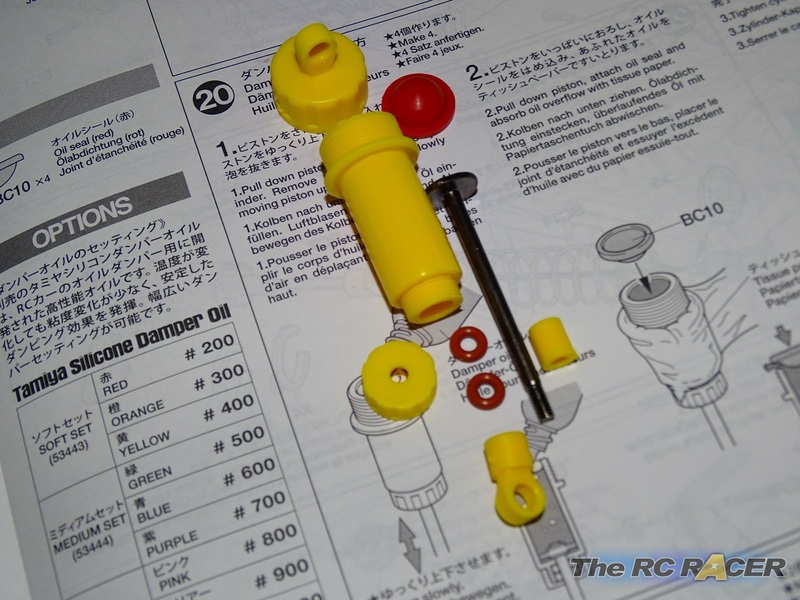 Tamiya manuals are probably the best out there. 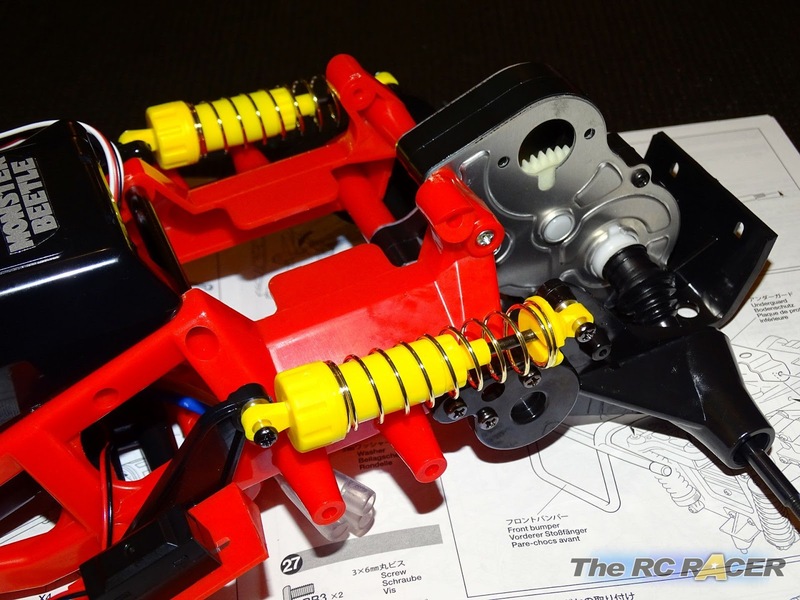 With the central chassis together we start to work on the steering tie rods. 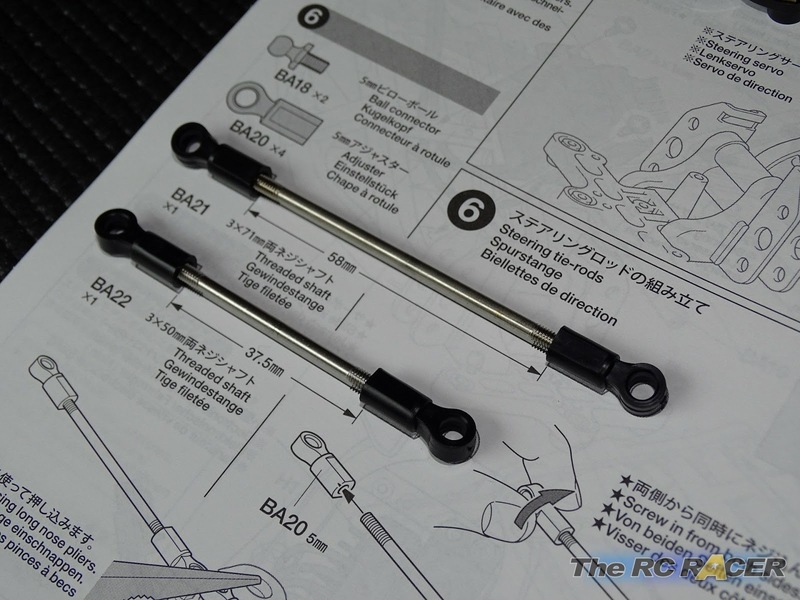 These are steel and, as it this a Tamiya, you can just screw the 5mm adjusters on each end until they match the length shown in the manual. Following this we attach the steering arms to the servo saver. It is basic and chunky and should be fine to get started with. The steering arms are connected to the front axles. These are chunky affairs with two large plastic parts bolted together with 4 large screws to provide a rugged C-Hub (Unlike the TRF419 ones). 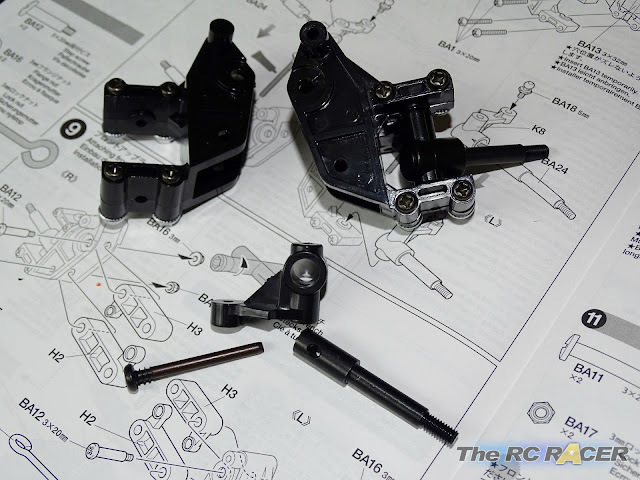 Once these are assembled we need to add the front axles. These are made from steel and are very sturdy. 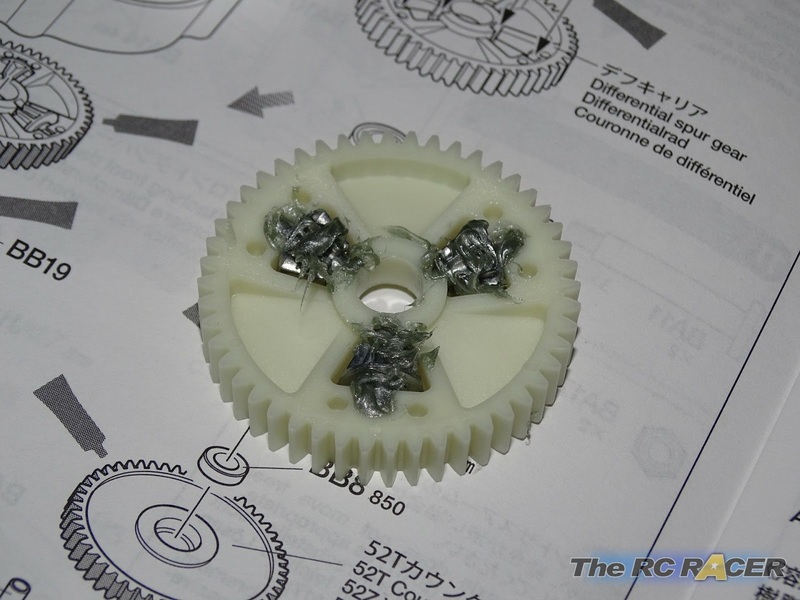 They fit into the c-hub with a classic Tamiya Step screw. 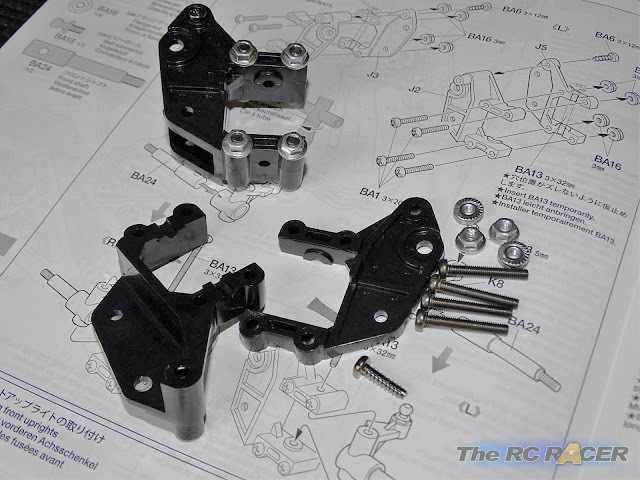 Part BA25 is part of the front suspension layout. With these assembled we then need to fit the chunky front arms, they have spacer moulded into them that allow the arms to move around and stop them binding together. 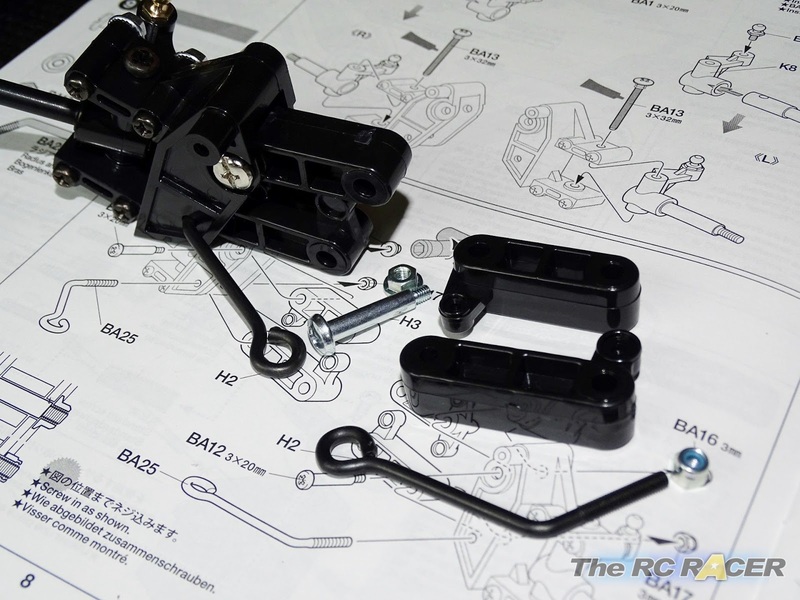 Here you also fit the bent hook thingy which links to the front of the chassis and acts a little bit like a torsion bar. 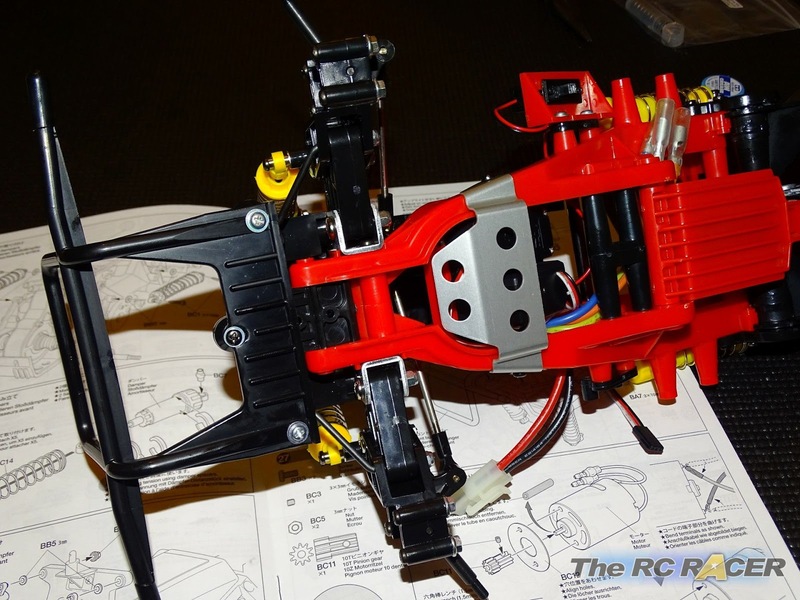 With these all assembled we need to mount the arms onto the chassis. Again you will want to use Tamiya set screws. These are held in the steel suspension mounts with two bolts. They need to drop under their own weight, so make sure you do not over-tighten them. The upper bolt is harder to fit, I used a set of pliers. So it's time to work on the business end. 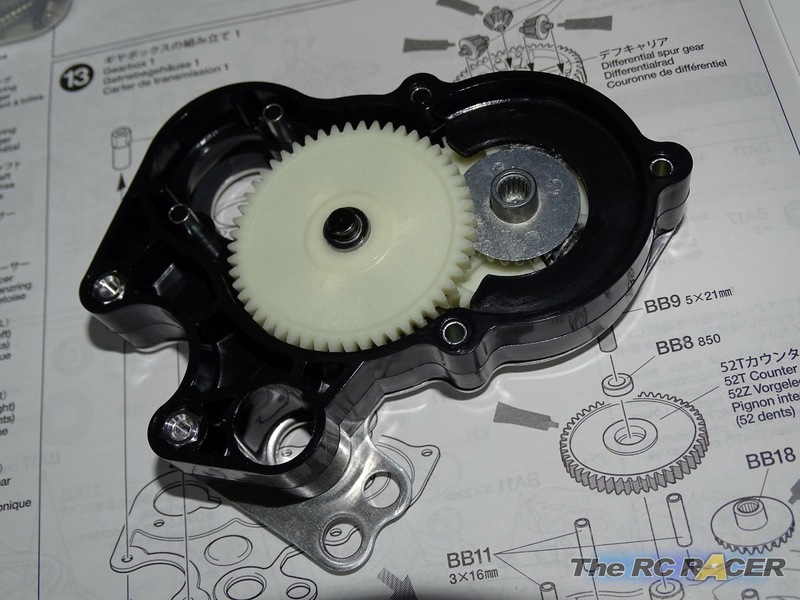 When building the gearbox it is good to take your time as it is a pain to go back and work on this once you have finished building the car. 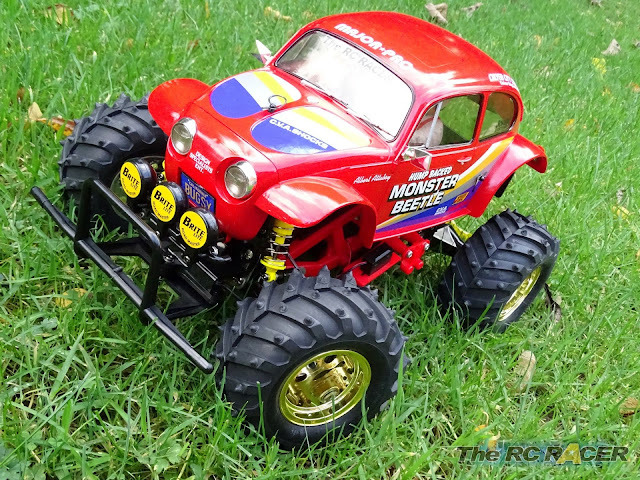 The Monster Beetle is a nearly 30 year old design and that means that the gearbox is not going to be as advanced as modern RC cars. You still have a differential, however it was designed before crazy brushless motors were around, so you will have to consider that when upgrading your motor. As a reference point I have a friend who has a Monster Beetle that is nearly 30 years old and his car has been very well used and he has never had to rebuild the gearbox! Needless to say I got a few pointers from him when building my version. First up we want to assemble the differential spur gear. As you can see I did not use the grease listed in the instructions but instead used the AW grease that is used in the kit. The stickier grease will give you more of a stiff diff and this will allow the gearbox to handle power better. The gearboxes have two pressed metal halves, here you need to fit the bearing mounts. The lower part is attached, now time to fit the top. Time to place the plastic core section onto the metal half. Here you have to place the differential spur on top of the steel bevel gear and wiggle it around a little bit, but you do not have to be too precise. The 52T spur is next, which sits on a solid steel shaft. 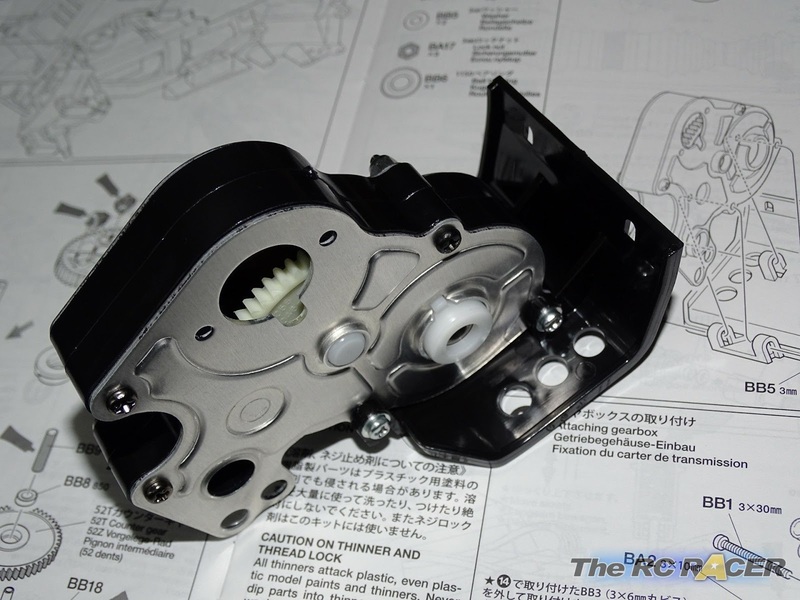 You also then strengthen the plastic gearbox with hollow steel tubes which will ensure it keeps straight once you mount the other metal plate. That is a thin gear box. 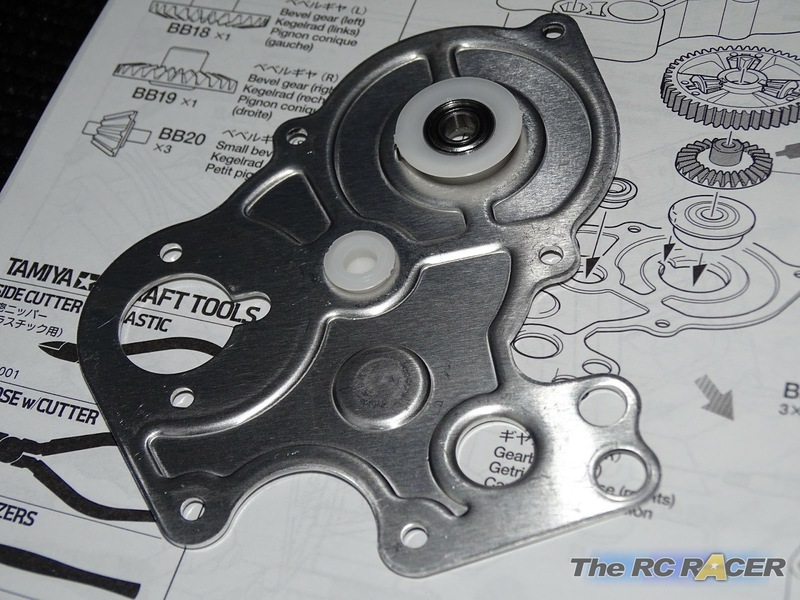 The other plate is attached and you use the long machine threaded screws to bolt it together. This gearbox is then strengthened even more with the rear bumper. Now we attach it to the chassis. The whole thing is feeling really solid now and the chassis is looking very distinctive. Something that gives these re-releases some of their retro charm. The rear axles are next, and I was surprised to find that the kit comes with rear universal drive shafts. 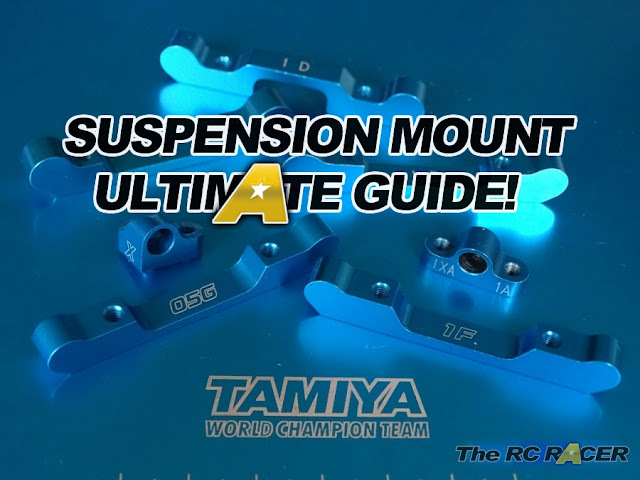 This is a great thing as they are much more efficient at putting the power down through the whole suspension range. 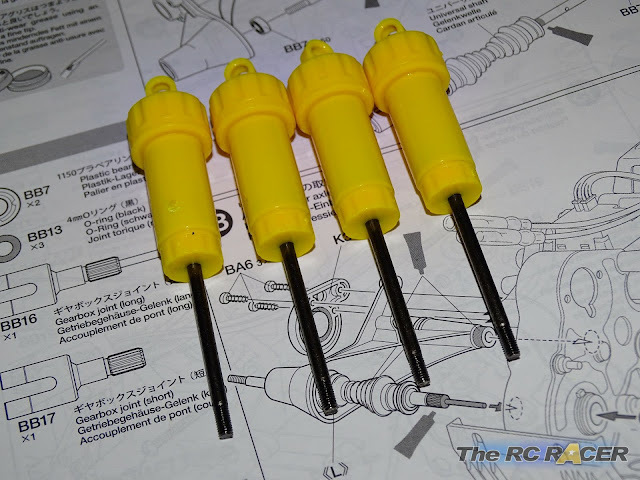 They are easy to build, I dab a little of the AW grease on the drive pin only. I also use a little thread-lock on the grub screw that holds it in place. Tip - When you build your drive shaft, make sure that the pin is seated perfectly and does not pop out of any of the sides. This will make your drive shaft vibrate and ultimately break. It is a very easy thing to overlook if you have not made them before. 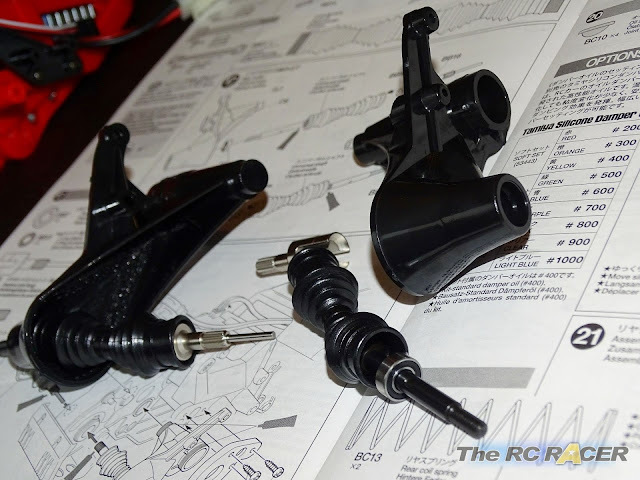 With these built we then mount them in the rubber protective covers and place them in each of the chunky plastic arms. (Note - As I was using universals I also but a few 0.1mm shims between the 10x2mm pin and bearing to take out any movement and vibration). 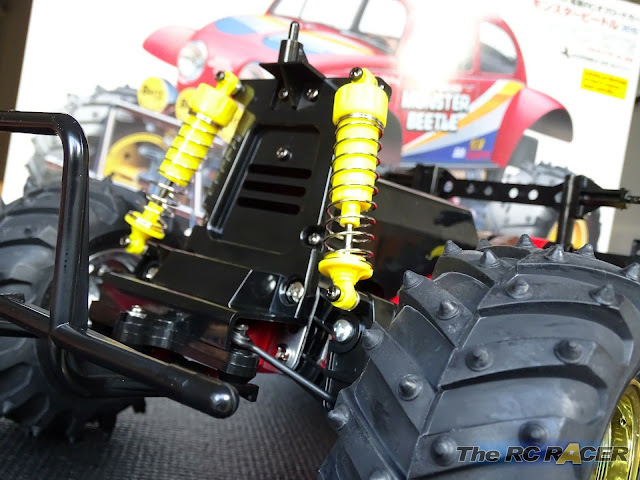 The Monster Beetle has a very distinctive trailing suspension arm design. It still gives independent 4 wheel suspension, and it really helps make this car much more unique looking that many other Monster Trucks. This is a classic Tamiya and hence that means it has the large yellow CVA shocks. These are slightly different to the originals as the damper plate is moulded to the suspension shaft. This makes construction easier, but does take away any tuning issues.. although for a Truck like this it's not actually important. The most important thing is to not split or damage the o-rings. 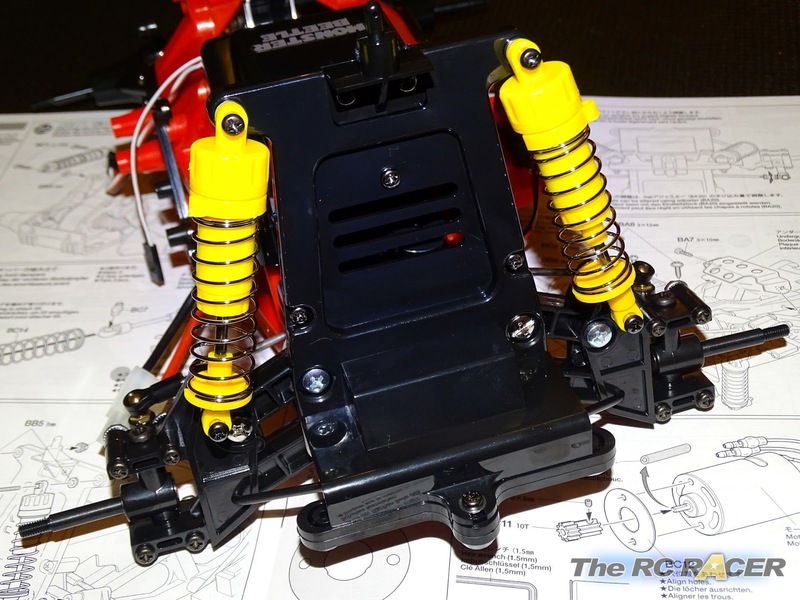 To do this just add a little drop of the included shock oil (Yellow 400wt) on each and fit them. Then squeze out a couple more drops onto the shafts and rub it all over them with your finger. Gently slide it through and you will have a nice smooth motion. You can then fill your shocks, wait 5 mins for the air to all come out and pop the tops on. You then need to attach the springs. In the box there are two colours, the gold goes ones go on the rear and the silvers on the front. 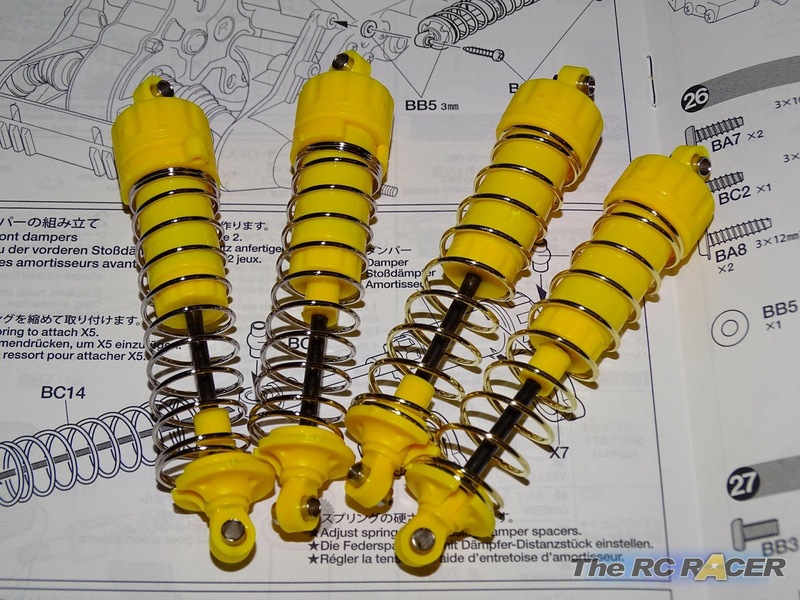 There are also a set of shock limiters that go on the shafts. 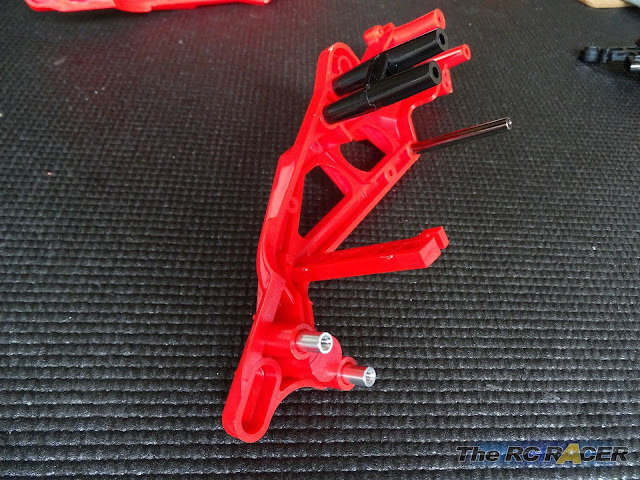 These help keep the car's drive system working well when landing from large jumps, keeping the rear axles in the best possible operating range. Is this the largest shock tower in RC? Now it's time to fit them on the chassis. First it's time to fit the front ones on the rather large shock tower. 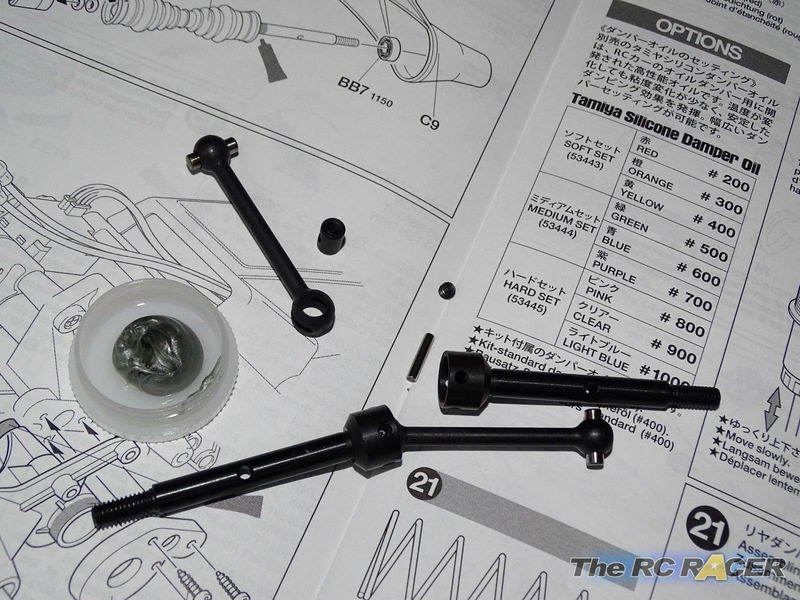 Now you fit the rear shocks, a gentle squeeze and you can see and feel the trailing arms moving. The whole range of movement feels nice and smooth. The car is nearly complete so we have only a few things left to assemble. The large front bumper is next. 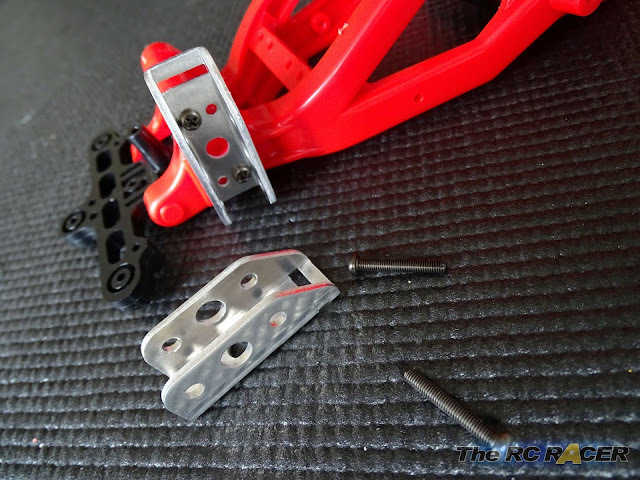 This is attached with 3 screws on the front of the chassis and will hopefully help protect you from the occasional mishap! The kit comes with a classic RS540 motor. 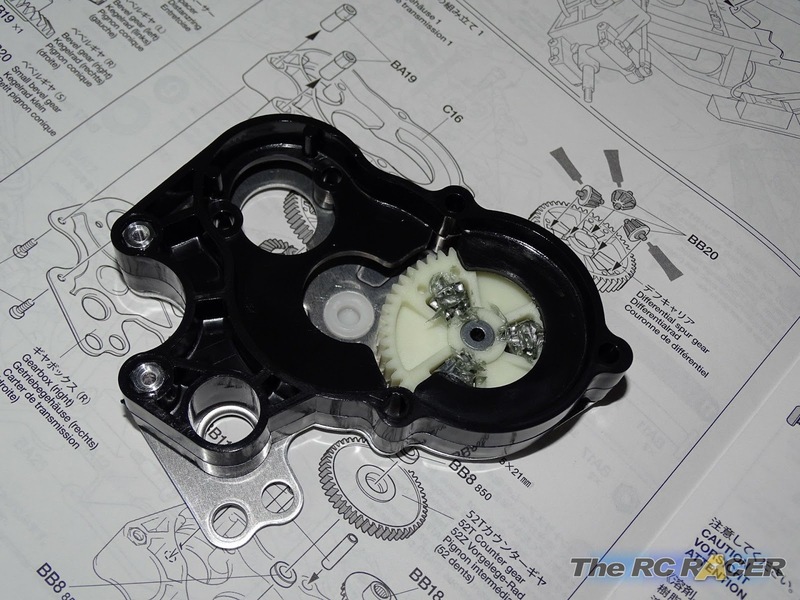 You need to fit the plastic motor mount onto it and also ensure that the 10t long boss pinion is attached. The side body mounts will help keep the shell sitting well on the car. Then its time to install the motor and the body mounts. As you can see the Monster Beetle has some side mounts that have to be fitted to hold the great looking shell. Just got to fit the massive rear bumper and the gold rims and tyres. 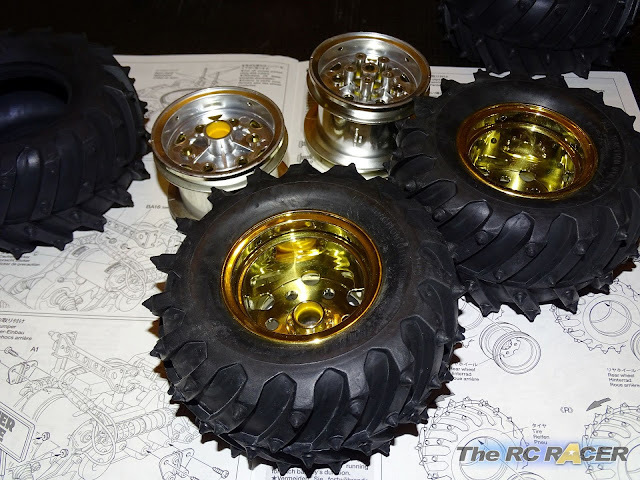 The tyres are made from a medium stiffness rubber and they have spikes for that extra bite on rough surfaces. The front wheels fit on the axles via some 1150 bearings. The rear wheels are not a standard 12mm hex fitting, but they feel secure on their plastic wheel mounts. The chassis is now build and it looks great. There is a real charm about this space-frame chassis. Every angle of the chassis has something that looks interesting and unconventional. This is one of the great charms of older designs. At the time no one knew what would make a great RC car so all of the designers were trying new things to help pioneer the types of cars that we currently use. There is an air of strength and poise with this chassis. It feels solid, like a car that is begging for you to take it out and have fun. The shell is amazing. It is made from red plastic so you could just sticker it up. I however sprayed mine as I wanted to give it a showroom style finish. I would recommend Tamiya TS paints as I have tried other makes on hard shells, but I always seem to get a better finish from these paints. I took my time painting many fine layers, letting the paint dry and then applying some more. 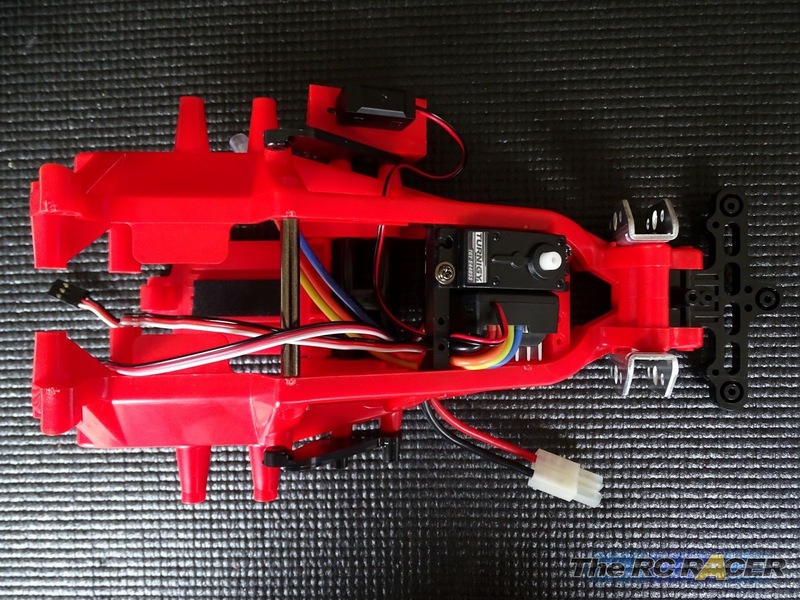 It took longer to assemble the shell than it did the chassis :) Here are the end results. I love it! The rear lights are separate and need fixing on the shell. 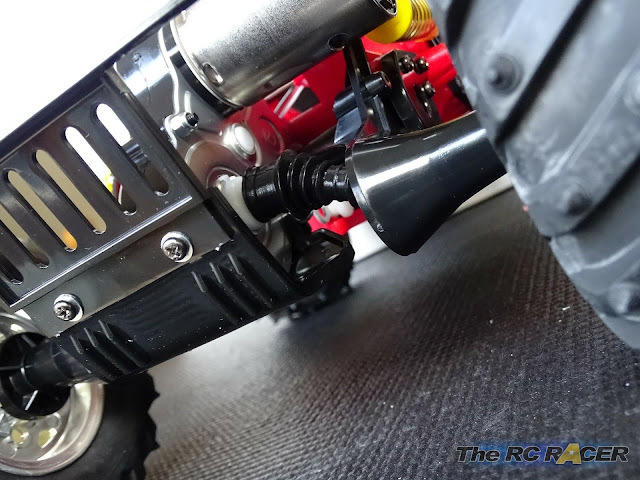 Tamiya excel at this level of detail! I wont lie, after all the effort put into doing the shell I was a little hesitant when I first took the car out for a test run in the garden. I pushed up and the car sprung into life. I only had a slightly charged shorty on hand but I was happy to say that the Monster Beetle 2015 seems to accept square lipo packs easily. The car looked great, the weight of the shell and the smooth shocks allowed the car to soak up any of the minor bumps in its stride. I soon found myself enjoying the driving around my garden that I stopped worrying about the shell and started to hunt for larger bumps and humps in the garden in an effort to get the Monster Beetle some air time. I only had a few minutes though before the sky darkened and the rain started. The next outing was at our special top secret stunt track. The sun was out and I took it out to get some better better photos and to see how it could cope with some much more extreme terrain. 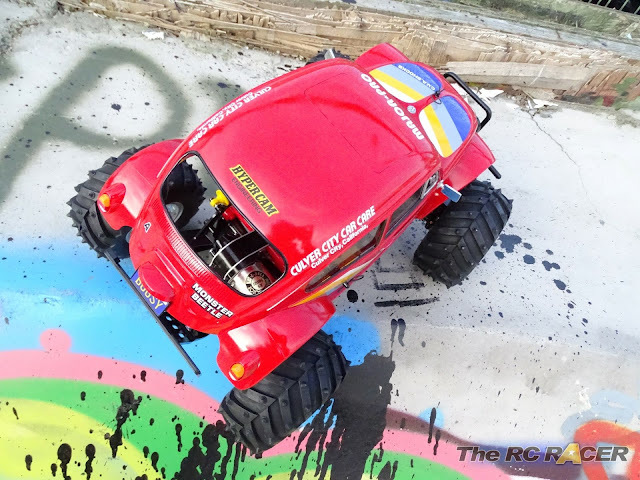 The stock 540 motor pushes the Beetle along at a steady rate and on the concrete surface as it hopped over some of the milder kick ups. I was also pretty impressed with the steering lock, obviously as this car is 2WD when you are at full throttle the car will have quite a lot of under-steer, however ease of the throttle and you can soon hook the Monster Beetle up and grab back some front grip to tighten your line. A dab of brake will help you kick the rear end into life if you want to steer sharply around the apex.. or in my case avoid some bricks that would have scrapped the precious shell! Another thing that impressed me was that the Monster Beetle actually was quite planted on it's 4 wheels. Yes the motor is wild, but I soon felt really confident that the car was not going to roll whenever I decided to turn it. I rant the car for about 25 minutes, and by the end of it's run it had attracted quite a crowd of the hipsters that work in the area. I was surprised at how many of them were interested. We have ran a lot of cars on this track but none so far have managed to attract so many people stop and look. 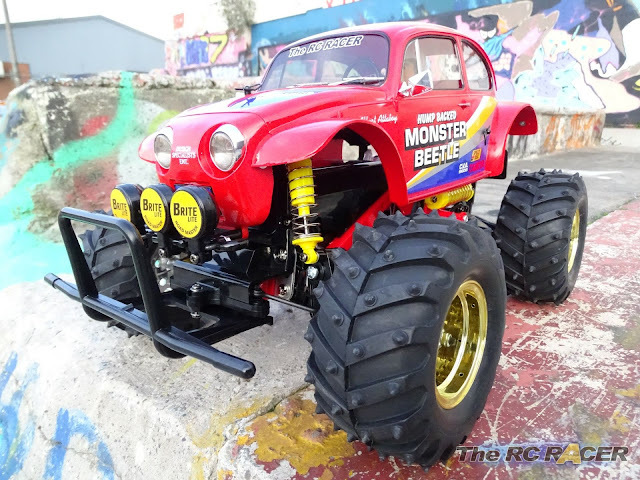 The Monster Beetle is an Icon though, and the scale shell and bling gold rims make it look great as it whizzes around the stunt park with the sun glistening. One guy was so enthused that he was planning on going to the Local Tamiya stockist (Steve Webb Models) to pick one up later that day. 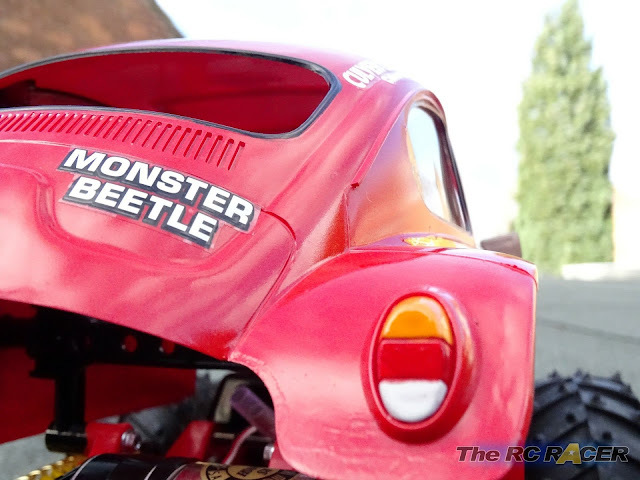 The Monster Beetle 2015 has absolutely won me over. I always loved how it looked as a Kid, but now after building one and running a lot of batteries through it I am also sold on how much fun it is to drive. I just cant stop smiling when I look at it moving around, the suspension soaking up the bumps and watching it jump (Which it does surprisingly well!). It's hard to find many negatives about this kit. Yes it's not a modern design, but that is what gives it it's charm. The gearbox is not designed for a crazy fast brushless motor (although I imagine some will try) Also it doesn't come with a full set of bearings, although the remaining ones needed can be bought for only a few pound. Other than that the car has been driven for many battery packs (10+) and nothing has gone wrong, broken worn. So glad I found this post, I've just bought one and the step by step guide and tips will be invaluable! Cheers! No problem, enjoy the car its fantastic! What servo did you use? I believe there is no servo included right? 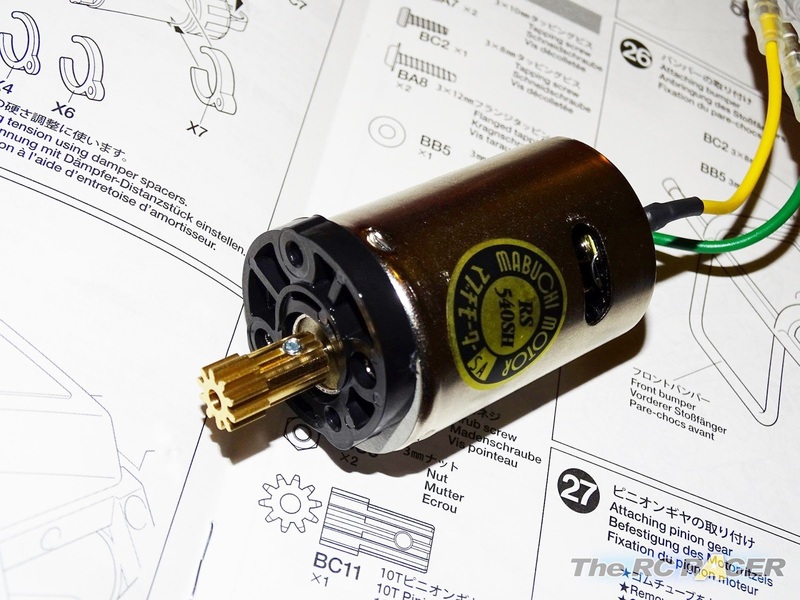 I used one from Hobbyking. A standard servo is perfectly fine in this car. 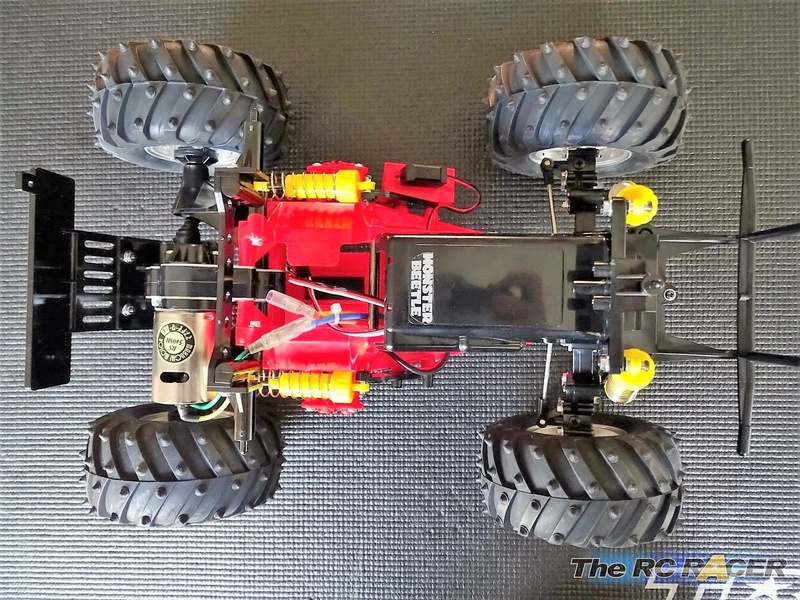 Great Review - The MB was my second RC Car bitd, and I was always appaled at how poorly it handled even as a kid. Watching Matteo's video above makes me want to buy a re-re, not because of the (still) appalling handling but because of the amazing looks that have aged so well. 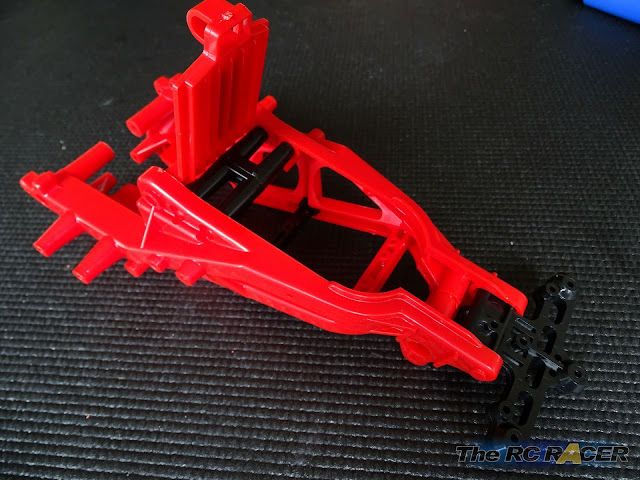 The suspension still seems to be as badly setup as the original kit, it looks desperately oversprung and underdamped - just like a classic tamiya should be! I recently completed my Monster Beetle and was keen to give it a test before I got started on the body shell. I noticed that the gearbox and wheel axel were really noisy and quite rattly. Although it didn't sound very happy, I went against my better judgment and gave it a quick run round the garden... Within moments the car stopped moving completely while the motor was happily spinning away. I rescued the poor thing from the bushes and straight away noticed the problem. On the right side of the gearbox, the round end of the swing shaft had popped right out of its place in the (short) gearbox joint. Its almost as if the right hand side Swing shaft is too short?? I have made sure that everything is in place and as tight as it should be, but no luck. Have you experienced anything like this with your build? I have the old Monster Beetle and the drive shafts are completely rounded. I would like to buy the spare bag from this kit but don't have the reference. Would you please be kind enough to send me the bag reference that is in the guide? And do you by any chance know if it is possible to order it somewhere online? I didn't find that on Tamiay's website. 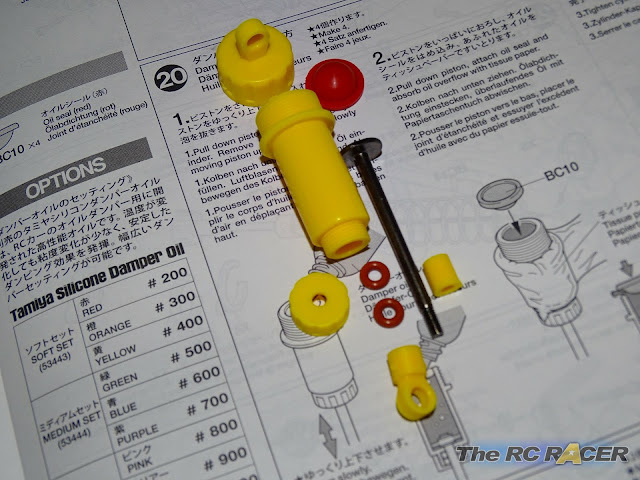 I eventually found that on ebay, where several shaft kits are available. Wooow! Blast from the past! It reminds me of my childhood days. 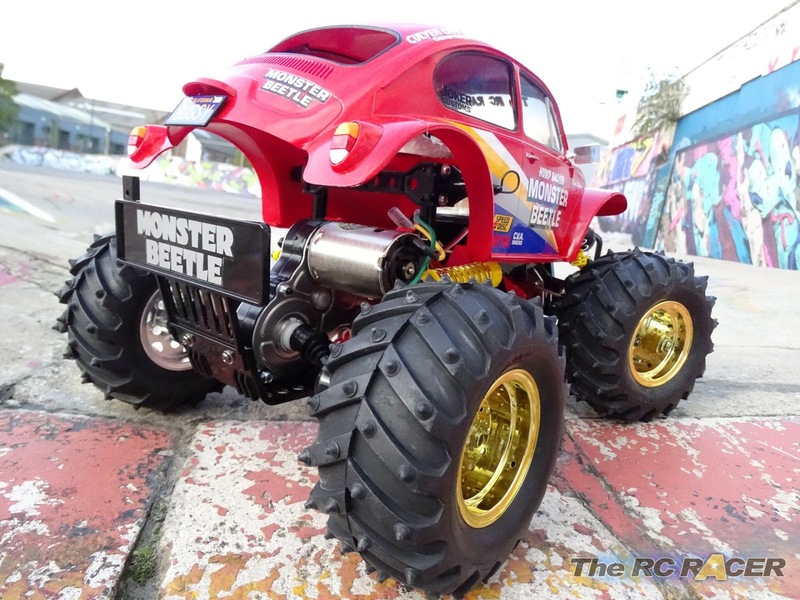 This is our second RC Car after Tamiya Hornet. Just to clarify with you, the stock ESC and Motor accepts Lipo packs? Zippy Compact 2S (Two Cell Lipo) will suffice? Appreciate your confirmation about using Lipo Packs as I will get one (Tamiya Monster Beetle) from my LHS. I had no issue fitting mine. 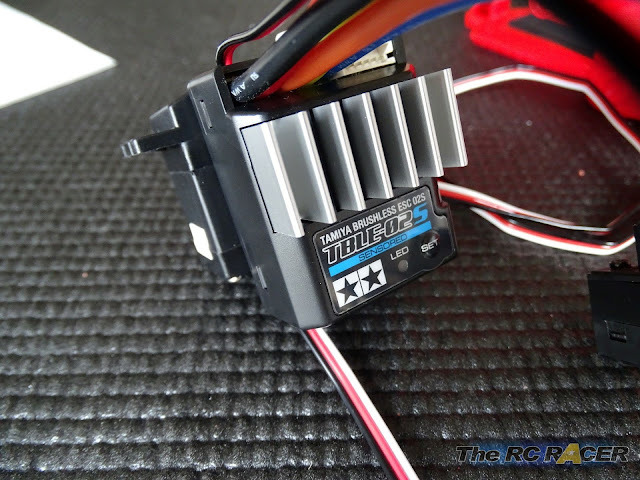 The kit esc is fine with 2s (7.4v) lipo but there is no low voltage warning. So just be careful not to run the battery too low, or just buy a cheap LVP alarm (Less than £2) which you can add on.